Each year, thousands of people in the U.S. die from the flu. It can cause serious complications, particularly in infants and young children, adults age 65 and older, and pregnant women. If you have a medical condition, such as heart disease, the flu can make it worse. Influenza infection can also trigger asthma attacks in people with asthma. Flu vaccines are the best way to prevent flu and its complications. Although not 100 percent effective, a flu shot can keep you from getting infected, make the flu less severe if you get it, and keep you from spreading it to your family and others. Who needs an annual flu shot? The CDC recommends that everyone 6 months of age and older should get a flu vaccine every year. The vaccine is given as a shot, usually in the arm, or as a nasal spray. The U.S. Food and Drug Administration (FDA) approves different influenza vaccines for different age groups. Children between 6 months and 8 years may need two doses of the vaccine, while adults age 65 and older may need a high-dose vaccination. Children younger than 6 months of age are too young to get a flu shot. 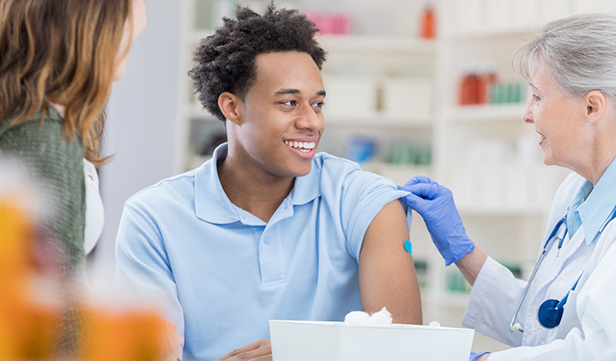 If you have a severe allergy to the vaccine or to eggs, gelatin, antibiotics, or other ingredients in the vaccine, ask your doctor or pharmacist if the vaccine is right for you. Also, you may not be able to get a flu shot if you have a history of Guillain-Barré syndrome (GBS), a rare autoimmune disorder. Finally, if you’re under the weather, it’s often best to wait to get a flu shot until you’re feeling better. Flu viruses evolve quickly. Manufacturers release new flu vaccines every year to protect against the three or four influenza viruses that researchers expect to be in circulation during the upcoming season. It’s impossible to predict influenza viruses with 100 percent certainty, so the effectiveness of the flu vaccine varies from year to year. In recent years, when the flu vaccine matches the viruses that are circulating, vaccination reduces the risk of illness by about 40 to 60 percent. Sometimes it’s less effective, sometimes more. In past years, the vaccine has been up to 90 percent effective at preventing the flu. 1. Side effects of a flu shot can include soreness, redness, or swelling at the injection site. Also, as your body produces protective antibodies, you may experience a low-grade fever, headache, or muscle aches. 2. Two weeks is about the time it takes for the flu shot to become fully effective. If you were exposed to a flu virus right before you got vaccinated—or during the time it takes your body to develop full protection—you could catch the flu before the vaccine starts to work. 3. Different flu viruses circulate each year. You could get sick if you’re exposed to a virus that’s not included in the seasonal flu vaccine. 4. Health factors and age can affect how well a flu shot works. Some people can catch the flu despite being vaccinated. Flu vaccine is most effective for older children and adults under the age of 65. Some older people and those with certain chronic illnesses may develop less immunity after getting a flu shot. But if you catch the flu, the vaccine offers some protection. Your illness is likely to be milder, and you’re less likely to be hospitalized. 5. Other illnesses, like the common cold, can produce flu-like symptoms. Avoid crowds during the height of the flu season. Living a healthy lifestyle can also help keep you at the top of your game. Eat a healthy diet. Stay physically active. Get plenty of sleep. And manage your stress.